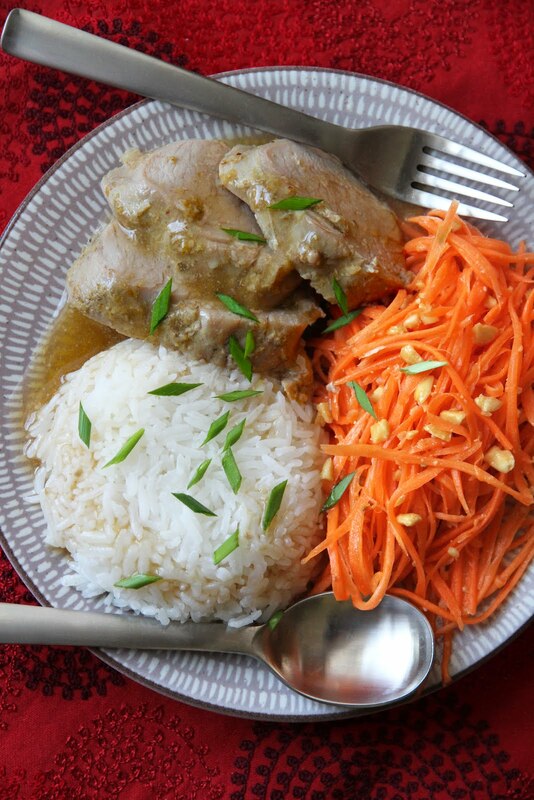 Fragrant coconut rice, spicy carrot salad, and this saucy baked pork form one of my favorite meal ensembles. The idea of making three different dishes in order to create this one coordinated meal may seem daunting, but these three components go so well together that, as tempted as I am to tell you that you don’t need to serve all of them together in this manner, I’m going to encourage you to give this combo a try. I may fail as a writer in not being able to convince you with anything more eloquent and persuasive than, “This is really good! You should try!” But I find consolation in the confidence that I won’t fail you as a friend. Hopefully, if you follow the following steps, creating this dinner won’t be such a hassle. Here’s the game plan. If you’d like this for dinner, marinate the pork and stick it in the fridge (along with a bottle of Riesling, perhaps?) before you leave for work. When you get back, put the pork in the oven and let it cook for 40-45 minutes (see the recipe below). While the pork is baking, make one recipe of coconut rice with chives on the stove top or in a rice cooker. As you’re waiting for the rice and the pork to cook, make 6 servings’ worth of Som Tam, substituting grated carrots for green papaya and leaving out everything else except garlic, chilies, peanuts, fish sauce, sugar, and lime juice (alternatively, you can replace carrot Som Tam with one recipe of Russian “Korean” Salad). 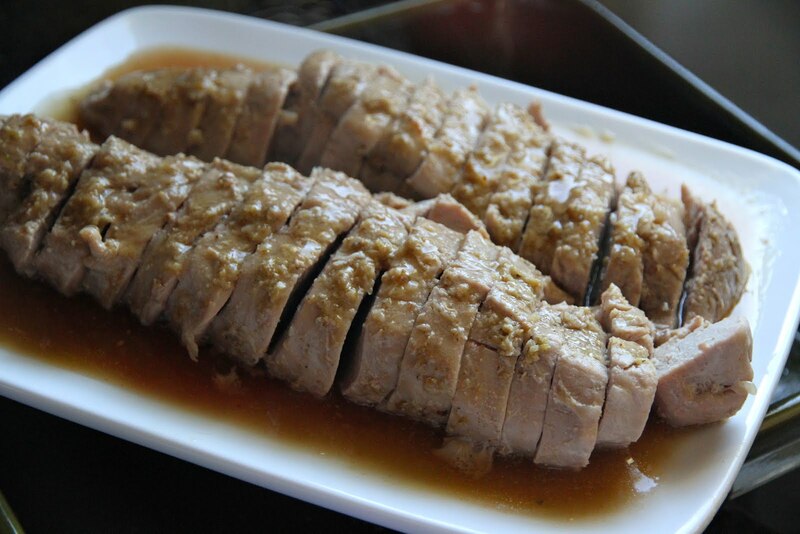 Place the pork tenderloins in a large (9″x13″) glass or ceramic baking dish. Stab them a few times with a fork; set aside. In a mortar or a small chopper, make a fine paste out of the ginger, coriander seeds, peppercorns, cilantro roots, and garlic. Transfer the paste to a small bowl. Add to the paste the remaining ingredients, except cornstarch, and mix together with a spoon. Pour the marinade over the pork tenderloins, making sure all sides are coated with the marinade. Cover the baking dish with a piece of aluminum foil and refrigerate for 2-3 hours, up to overnight. Remove the pan from the refrigerator while you preheat the oven to 375°F. Bake the pork, still covered with the piece of foil, for about 40-45 minutes or until the pork is cooked through. Transfer the cooked pork to a large plate; set aside and keep covered. There should be quite a bite of juice in the pan. Pour it into a measuring cup and see how much juice you have. It should be close to one cup. Add plain water to the juice so you have a total of 1 1/4 cups liquid; pour the juice into a small saucepan. Make a slurry by whisking together the cornstarch and 1/4 cup plain water, making sure there are no lumps. Add the slurry to the juice in the saucepan. Heat the sauce mixture over medium heat, whisking occasionally, until it bubbles up, turns somewhat translucent, and thickens up; remove the sauce from the heat. Slice the reserved pork tenderloins crosswise into 1/2-inch thick pieces; arrange the pork on a serving platter. Pour the sauce over the pork and serve. I love pork tenderloin and am loving this combination! Your blog is just phenomenal, it’s an amazing resource. Thanks! Rick – Might not be a bad idea. At the very least, you get more color that way for sure. Would you kill me if I drained off the marinade and grilled the pork, instead? sundevilpeg – I’d give you a hug for having such a great idea. I love the coconut rice with this and the above mentioned idea of grilling the pork, even though it looks pretty perfect just the way it is presented above. Anon – I think so. You just to have to adjust the cooking time accordingly. love cooking – Kimchi would be nice indeed. I love learning new recipes. I also love a lot of the flavours that are present in this expansive part of the world. I will be trying this. First – what a great blog you have. I like this pork recipe, but I’m wondering how this pork would taste if it would be seared first and than follow the rest of your recipe. What do you think? Frank – Thank you. Sure, that sounds like something worth a try. Thank you for the blog! Love the recipes and also the stories you give with them. I was looking for something Thai inspired for a pork loin. (How can I resist pork loins at $1.50/lb!!!) But being impatient I didn’t want to wait for the marinade. Didn’t have any alcohol on hand. So I just did the rest of the ingredients, less the corn starch, into a paste. Then I sliced the pork loin lengthwise into about a 1″ sheet, unrolling it as I went. I spread the paste over the meat sheet. Sprinkled some thinly sliced lemon grass and Cayenne peppers on top of that. Then rolled the meat back up into a tube and tied butchers twine every couple of inches. Figured some kind of glaze would be nice on top, so took a couple tablespoons of your Thai three flavored sauce and thinly spread over the top. Grilled it over indirect heat with a small box of Pecan and Hickory wood at 325deg till the internal temp hit 145deg. When sliced, the presentation was spectacular with a spiral of the green paste and red peppers. I had it with brown/red rice and your nam pla prik. I’m trying to keep from digging into the leftovers as I write this. Thank you! Wow. That sounds really good! Thanks for sharing.